A stunning 3D picture within a solid crystal glass block. 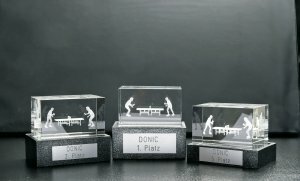 These units come with 3 different height motifs, designed to be for trophies for #1 (4cm motif), #2 (3cm motif) and #3 (2cm motif) position winners. Plague with names not included.